The archives of Bancroft Library hold many documents and letters of the Marsh family. In a joint project with the John Marsh Historic Trust, the Bancroft Library microfilmed several boxes of Marsh primary source material. The following excerpts are a tiny part of this important collection. Doctor John Marsh was the first American born pioneer to settle permanently in Contra Costa County. He carved out a huge cattle empire on the wildest part of the raw northern frontier of Mexican California. John Marsh was also one of the few college-educated adventurers in the far West and secretly worked to bring California peacefully into the Union. 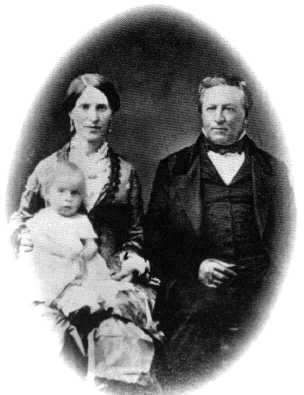 Abby Marsh was born Abigail Tuck in Chelmsford, Mass. She was bright, independent, beautiful and well educated. Abby had a spirit of adventure that was unusual for a woman of her time and station. As a young woman, she moved to the South and earned a good living as a private tutor and teacher. She had many suitors but found none of the men acceptable to an independently minded woman. After gold was discovered in California, she sailed to San Francisco with a party of missionaries seeking fortune and better health. Abby suffered from a recurring lung infection (probably tuberculosis). Her health and death were constantly on her mind. Once in the far West she met a mysterious cattle baron, Doctor John Marsh, a Harvard graduate living on the edge of civilization. After a whirlwind courtship, she became the mistress of an agricultural empire, the Los Meganos Rancho. Abby was suddenly thrust into a new life far different from that of her proper New England upbringing. Experiencing loneliness, hardship, danger and stalked by tragedy, she also found the love and devotion that she had long sought. The following letters give us an unusual glimpse into a time and place where disease, accidents and outlaws made death a constant companion. We will let Abby and John Marsh speak to us in their own words. The grammar, spelling and punctuation is theirs and has been retained whenever possible. ...I concluded(sic) to stop a few weeks with Mrs. Appleton a lady with whom I used to board with. She promised to take me on a pleasure trip over the mountains into the San Joaquin Valley. This trip promised to be quite an interesting one. The first day we came about twenty five miles. The next morning we started early & wandered among the mountains. When about one o'clock we came to the place where we started from in the morning, then we took a guide who directed us over the mountains. About sunset we came to a bachelor's rancho, but no one was at home. We had seven or eight miles further to go but did not know which way it was. But we started out not knowing [where] we [were], [ventured] a few miles and then returned to the bachelor and found him at home and glad to see us. He was an acquaintance of Mrs. Appleton's. We stayed with him all night and the next morning completed our journey. The bachelor has been out here sixteen years. He is about fifty years old and is a graduate of Cambridge College. I like his appearance and have since become further acquainted with him. His name is Doctor John Marsh & he is [none] other than your brother-in-law. We were married on the 24 of June. Our acquaintance was short only a little more than two weeks but I had [no] risk to [run] and is worthy in every respect, [engaging] my affections. I feel that my roaming is at an end - I have some one to love and care for me and who has enough of this [material] goods to satisfy every reasonable want. I expect to spend my days here. ...Next year he intends to build a house. There is a house here, but not one that he wants me to live in. I know you will all be rejoiced to hear that I am married. Well, I think I have waited long enough, and I feel that I am compensated for so doing. He says he hopes he is a Christian & that is all I can find out. Pray for us that we be bright and shining lights in the world. My religious privileges may be small. The Doctor says he will go with me whenever I want to go to San Francisco. I would like to come home next year, but have faint hopes, only as I know it will be very difficult for us to leave. Please do write often and do not forget us. ...The Doctor used to be in Danniford, he spent some years in the West before he came out here. He joins in much love to you. I think I have got as good and kind husband as any of my sisters. You want to know how we find our cattle, when we want to drive them all together which is called a [roundup], some eight or ten men go in different directions and drive to a particular place, when the cattle get there they stop. This is called the rodeo ground which the cattle all know as well as we do. Then if we want to sell any we point out those we want to sell and drive them off. Our cattle are all marked in the ears and branded on the hips so that we know ours from other peoples and every owner has his brand and mark. So that if our cattle get on to other people's [crops] or farms we go and drive them home and other people do the same. They mark these once a year on every rancho. At the request of my dear wife I write you a few lines. As I expect to be but a few more days to spend in this world I must say farewell! But do not weep or mourn for me. You know the source from whence to draw consolation - In a few more months or years I expect to meet you in another & better world where the wicked cease from troubling & the weary can rest. I did hope to see you again in this world, but God has ordered it otherwise. He calls and I must go. I have no wish to be here longer, but have rather depart & be with my Savior. Oh that I could have you here with me that I could have your prayers & your sympathies that are so much needed. May God bless you my Parents & support & comfort you. To you I must say farewell. Death is about to take one more of your little band and claim her as his own. Two of our dear sisters have gone & I trust are now hymning the praises of God. You are all professors of religion. May God enable you to adorn that profession & live a holy & devoted lives. Let the great object of your lives be to do good in the world. My strength fails me. I can say but a few words. The coolness of the weather caused me to revive a little. You may yet [ ] me to my husband and child a few more days or even weeks. Yet my disease is such a flattering one that I am liable to pass away at any moment. But Oh! My dear parents and brother & sisters. My weak & trembling hand would fain clasp yours & say farewell. May God bless & console you. Pray for my dear husband & darling child who need your sympathies. Abby is quite comfortable to day & has some appetite but is very weak. The above is written word for word from her dictation, but she cannot well dictate more now as it makes her cough. Rev. Mr. Brierly spent a day with her two weeks ago. At that time I did not expect her to live day to day - now she is a little better - more comfortable & stronger - she is surrounded by every comfort that can possibly be procured for her - She could not be better cared for except by her own relatives - I am going down to the city this evening & shall return by steamer by tomorrow evening & shall keep you constantly advised of her state. During the long & painful sickness of my dear wife I have continually kept you advised of her condition & I have now to communicate the sad news of her decease. She died last Saturday morning at 5 o'clock. Perfectly calm and resigned and even desirous to depart & with her Savior. I have been so oppressed with grief that I have not been able to send you the sad intelligence until today & now I can hardly tranquilize myself sufficiently to write. Yes, my dear Sir your affectionate & and most excellent daughter has departed from the earth to that eternal home where sorrow & sickness are unknown. I have lost the most loving, affectionate & dutiful of wives, & my child the kindest and best of mothers. Last Sabbath evening the remains were deposited in a place long ago selected by herself in the orchard near the house. The funeral was attended by a minister & a large concourse of friends & neighbors. She was repeatedly visited and consoled by the Rev. Mr. Brierly and other clergymen. She has for a long time been attended by Mrs. Osgood a member of the Baptist church & a kind & excellent nurse, & and(sic) by Mrs. Thomson her neighbor & particular friend. Some months ago she said to me that probably after her death her relatives might desire her body to be sent to the east. I informed her that whatever was her wish it should be complied with - Her reply was that she had no other wish "but to lie by my side of her husband," and whenever it shall please God to my spirit hence it is my intention to have [my] bones laid by her side. Your little granddaughter is in good health & is for the present with Mrs. Thomson by the special desires of the mother. At present I am so overwhelmed with sorrow that I hardly know what to think or determine, but it is probable that within the next six months I shall visit Massachusetts the place of my birth, & bring my little girl to see her grandparents. It was her repeated request during her last illness that I should marry again, & until then, that our little Alice should be in the care of Mrs. Thomson, an excellent lady & especial (sic) friend who resides in a house of mine at the landing. She is there at present in perfect health. A bright beautiful blue eyed little girl full of life & intelligence. She often speaks of her gran papa & gran mama & when I have been away longer than usual [she] asks if I have been to see them. I have long desired to take a journey to the land of my birth & the home of my childhood but it seems nearly impossible to be absent so long & I have no particular time set for it. My late wife's request that I should marry again was no doubt dictated by a regard for my happiness & the welfare of our little daughter, but it seems to me about impossible to comply with it at present - who is worthy to take her place? I have this day recd from my Son the sad news of the death of my brother Dr. John Marsh of California. He was murdered by two Spaniards as he was riding in his buggy to Martinez & had arrived within two miles of that place & about 1/4 of a mile of Col. Tiff's House when he was dragged from his buggy his skull broken his throat cut from ear to ear & stabbed through the heart about 6 1/2 o'clock in the evening Sept. 24. His body was not found till the next morning when his horse wandered in too (sic) the town which aroused the suspicion where the people turned out & found him & arrested one of them before night. The Drs.' money & $115 was found on him & he confessed enough to convict him & he was fully committed for trial. My son is at the Ranch looking after the Drs.' Property & the interest of the little orphan Alice. Alice Francis Marsh grew into a beautiful and wealthy young lady. She married John Cameron, and moved to Oakland where they built the elegant Cameron House. John Cameron invested in several unwise land developments eventually losing his wife's fortune. John was said to have been an alcoholic and abusive towards Alice. Alice divorced him and moved to Santa Barbara where she raised a daughter. She never remarried. Alice Marsh died in 1927 and is buried in Mountain View cemetery near John and Abby. It was claimed that shortly before Marsh died, Ygnacio Sibrian put out a $500 contract on John Marsh following a bitter court trial. One of the Marsh assassins was Sibrian's brother-in-law. Two of John Marsh's killers were tracked down and brought to trial ten years after the murder. The third was never caught. Charles Marsh, John Marsh's son by an earlier marriage was deputized in order to arrest his father's murders. One killer turned state evidence and was freed after the trial. The other served 25 years in San Quentin for second-degree murder before being pardoned by an outgoing Governor. Alice and Charles shared in the Marsh inheritance. The United States Land Commission in 1860 formally recognized over 13,000 acres as belonging to the Marsh rancho. The ranch was eventually sold to the Balfour Guthrie Company, a British conglomerate, who planted vast orchards and introduced modern irrigation techniques to the Brentwood area. Eventually the Cowell Company bought the remaining Marsh ranch acreage along with the old Stone House. Today much of the original Marsh ranch, Los Meganos, as well as the Stone House that John built for Abby have passed into the hands of the State of California. For the present much of the land remains as it was at the time of John and Abby Marsh. There is a currently a major effort to create a 3500 acre Pioneer State Park around the beautiful, old Stone House to commemorate the cultures of the Native American, Mexican rancho and the early American pioneer periods. Lyman, George D., 1930, John Marsh Pioneer: The Life Story of a Trail-Blazer on Six Frontiers, Charles Scribner's Sons, 394 pgs.